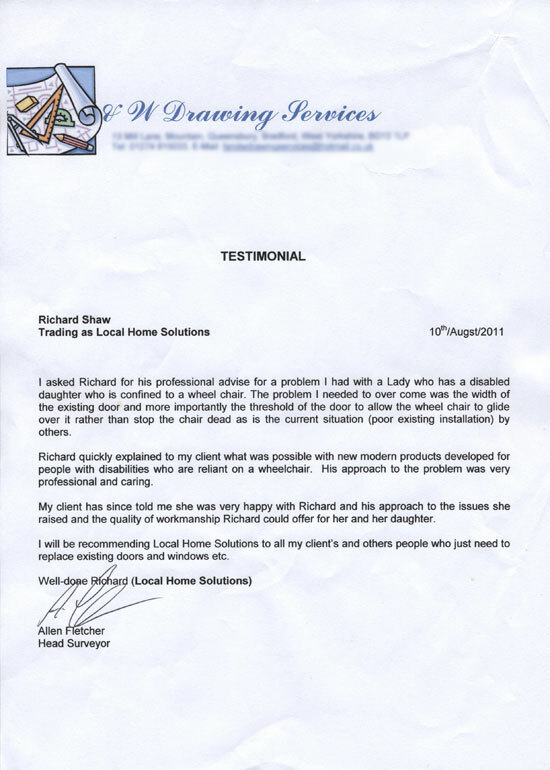 Below is just a selection of the positive feedback that we've received from our Customers. Click on one of the images to view the actual testimonial. I would like to thank you for all the work you have done for me over the years. You have always been on time for appointments. You have always explained clearly what your recommendations are and have worked to an agreed plan. Your prices have always been competitive whilst offering a superb level of service. The quality of your product is excellent. You have never said that it can’t be done. You have never left site without thoroughly cleaning and removing rubbish. In all, you have never let me down and to be honest that is practically a miracle these days. You are better, faster, neater and more competitive than any of your rivals. Although in truth you have no rivals. 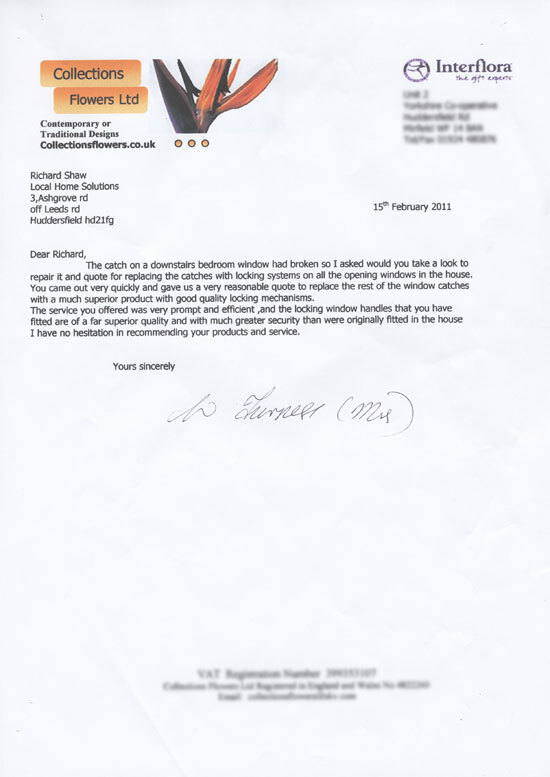 I would and do recommend you and your services to anybody looking for double glazing or a conservatory. Richard recently Manufactured and installed patio windows at my home. When he came to measure up he brought samples of the material to be used for the frame to make sure it matched the existing window frames. The window looks fantastic and I am surprised how much warmer the room is now the new window is fitted. 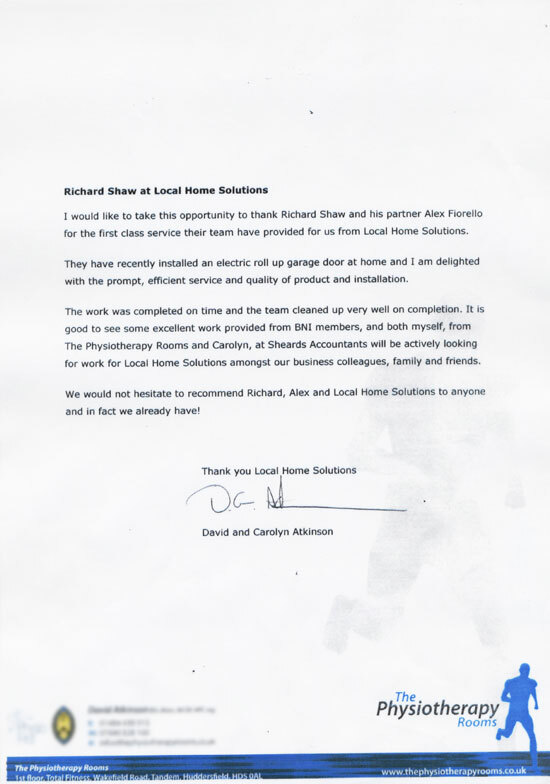 Richard and his team did a fantastic job and I have no hesitation in recommending him and would be happy to speak to any of his prospective customers. Local Home Solutions recently fitted a new glazed unit in my lounge window, after one morning finding it had moisture in it. 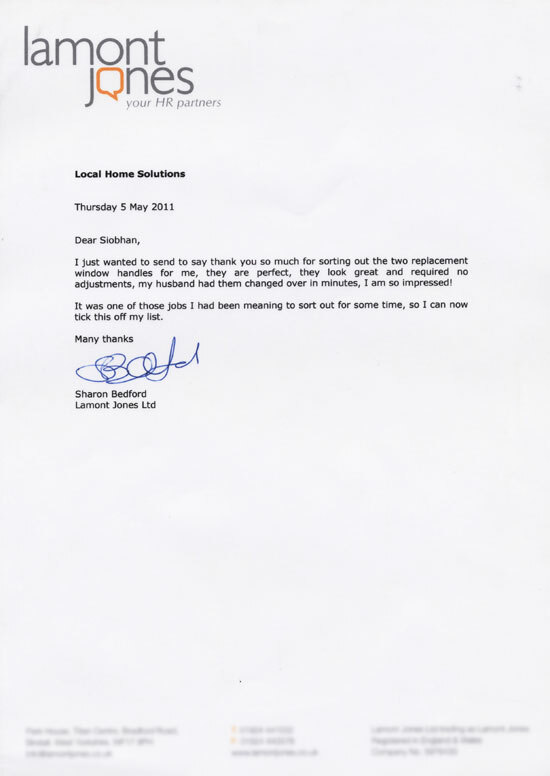 The service you provided was fast and at a very good price, your workmen were a credit to you and your company. They cleaned up, and removed all rubbish. I would have no hesitation in recommending you and your company to anyone. Please use this letter by way of recommendation to your potential Customers. 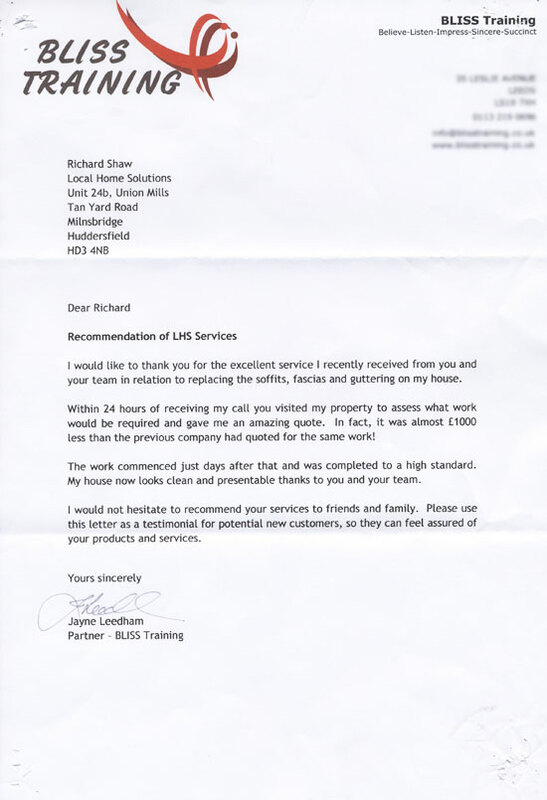 I would like to thank you for the excellent service I recently received from you and your team in relation to replacing the soffits, facias and guttering on my house. Within 24 hours of receiving my call you visited my property to assess what work would be required and gave me an amazing quote. In fact it was almost £1000 less than the previous company had quoted for the same work. The work commenced just days after that and was completed to a high standard. My house now looks clean and presentable thanks to you and your team. I would not hesitate to recommend your services to friends and family. 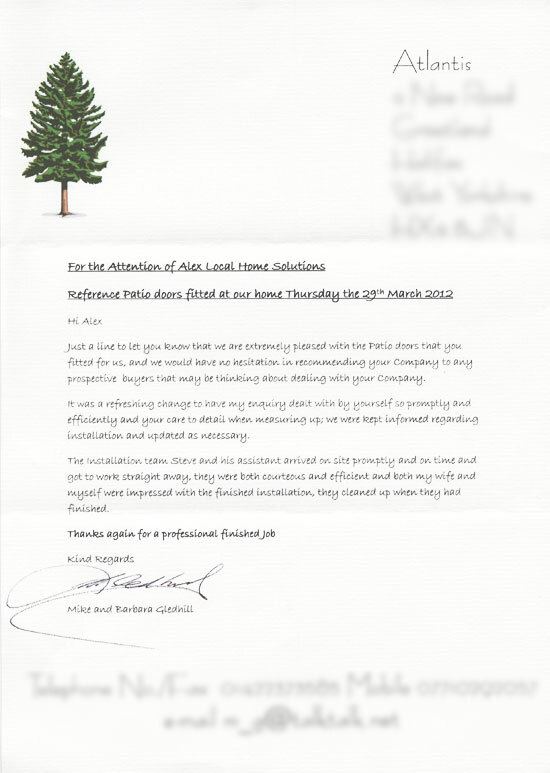 Please use this letter as a testimonial for potential new customers, so they can feel assured of your products and services. I’d just like to take this opportunity to thank you for the great job you did replacing my old sash windows, with their modern equivalent. Not only are they superior to the originals, but they’re draught free, fitted with Pilkington energy saving “K” glass, which has obvious benefits of reducing the cost of my energy bills come winter. There is also a great reduction in sound levels. They’re easy to open and clean compared to my old ones, most of which were painted shut. On top of that they even come with no fuss replacement guarantee if anything should go wrong. Your installation team, were quick, clean and polite, at all times. As for costs, you were cheaper that any other quotes I had received, even though you were installing the exact same product. Because of this I have no hesitation in recommending you to my neighbours who have since paid for their windows doing also. I am happy to recommend you further to anyone requiring UPVC products installing in their homes. Specialists in uPVC double glazing windows such as Sash, Sliding, Arch windows in a selection of colours.